Swarthy sometime-moustachioed antipodean troubadour Nick Cave is bringing his Bad Seeds side project, Grinderman, to the UK for a short tour this autumn. Now into his fifties and after thirty years in the music business, Nick Cave has become something of a legend if still an acquired taste. A bit like the humble olive. Comprising the same Bad Seeds band members, Grinderman was born of Cave penning raw, more bluesy material on the guitar. In 2007, the self-titled Grinderman album was released and the band did a few dates and festivals before the Bad Seeds day job came back into play when the Seeds' 14th album, Dig, Lazarus, Dig! was recorded and released. 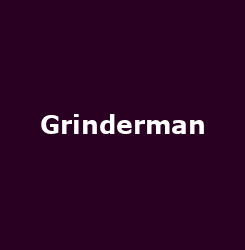 A second Grinderman album, purportedly to be imaginatively titled 'Grinderman 2', is set for release later this year and no doubt the autumn tour will include much of the new material. The Grinderman dates take in some of the UK's flagship music venues, kicking off at Nottingham's Rock City on 25 September. The short tour then moves to Leeds University, Glasgow's Barrowland and the Manchester Academy before closing at the Hammersmith Apollo on 1st October. Legendary venues for a legendary performer. Tickets (£25 regionally, £27.50 for London) will be in demand when they go on sale at 9AM tomorrow.